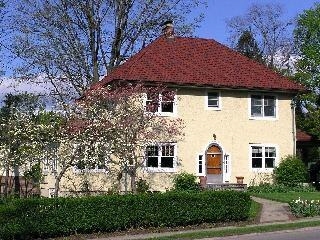 Charming Philipse Manor Sleepy Hollow Four bedroom Colonial. Relax on romantic vine-covered porch and enjoy Philipse Manor Lifestyle. Beautiful corner lot takes advantage of gorgeous golden light. Recent improvements incl gourmet kitchen w Viking 6 burner Range & Hood. English style fitted pantry & plate rack. 30 yr. Architectural roof done 2004. Short walk to parks, Philipse Manor Railroad Station - 37 minutes to Grand Central, private Beach & Boat Club.